Season the fish with salt and pepper. Panfry the fish in batches (about 2 minutes per side) in 2 tablespoons of canola oil and transfer to a platter. For the escabeche: Heat the remaining 2 tablespoons of canola oil in a skillet. Add the onions, garlic, bell pepper, bay leaves, olives and pepper. Cook over low heat for 3 to 5 minutes so that the onions don’t soften too much. Add the olive oil and vinegar, stir well and let cook for 15 minutes over low heat. Pour the mix over the fish fillets and let marinate from 6 to 24 hours. The more time you let it marinate, the more flavor it will have. You can add thinly sliced carrots to the recipe. 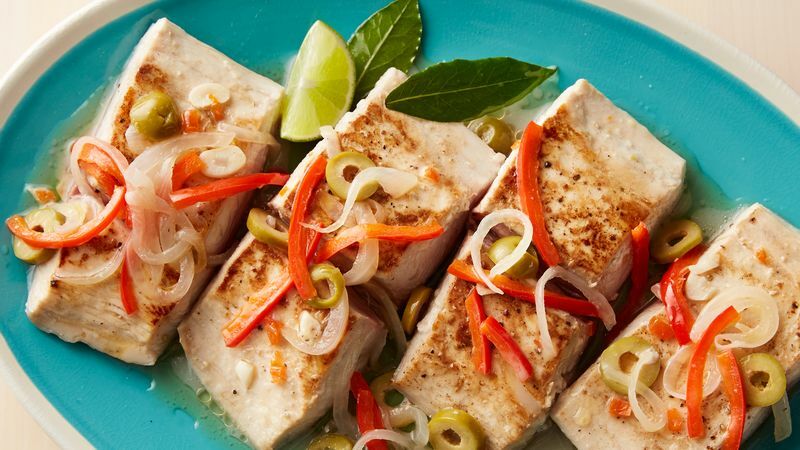 Fish escabeche is one of the traditional meals found in Christian homes during Lent, when many forgo meat for fish or seafood. I remember that my mom would prepare tons of escabeche to avoid having to cook a lot during the week. She would leave it marinating in a glass container with a lid, and she would also make seafood salads during this time.